THE Service version of the Supermarine "Seamew" Amphibian flying-boat is a reconnaissance three-seater with two Armstrong Siddeley "Lynx" engines, and it ДальшеMore>>> is this machine which is illustrated in the photographs. The following data, however, relate to the civil machine, which is very similar except for certain obvious changes such as the removal of machine guns and other military equipment. The "Seamew" is a typical Supermarine craft, and bears a strong family resemblance to the famous "Southampton," a type which has "made history" by many famous nights, as well as by its excellent work in the service. The "Seamew" is, however, considerably smaller, and its power-plant consists of two Armstrong Siddeley geared "Lynx" engines. The employment of reduction gearing has resulted in a considerably increased performance, more especially in the matter of taking off, when the extra propeller efficiency obtained with geared engines reduces the run. The climb also is improved. The civil version of the "Seamew" is designed either for passenger or freight carrying, and in the former case there is accommodation for six passengers and a crew of one, the pilot. The civil "Seamew" is of composite construction in that the wings and tail unit are of wood, while the boat hull and wing tip floats are of metal (Duralumin). The biplane wings are slightly swept back, and as in other Supermarine flying boats the monoplane tail is carried on a raised stern, well clear of the water. There are two rudders, each preceded by a vertical fin, working wholly above the one-piece elevator. The tail plane is braced to the stern of the hull by struts. The amphibian gear consists of two wheels mounted on a structure of steel tubes in such a manner that they can be raised clear of the water when the machine is afloat. Apart from its main function of a land undercarriage, the wheel chassis is also extremely useful in enabling the machine to alight near a beach and then, when the wheels have been lowered, taxy ashore under its own power without the fuss entailed in fitting a beaching trolley. The land undercarriage gear weighs some 200 lbs., or the equivalent of rather more than one paying passenger, so that for use over districts where the amphibian qualities are not essential, the machine can either carry the extra passenger, or the load made available may be in the form of fuel, thus extending the cruising range. The "Lynx" engines are mounted between the wings in the normal manner and drive tractor airscrews. The fuel tank is mounted in the top plane, on the centre line, a position which gives direct gravity feed to the engines. The main dimensions of the civil "Seamew" are as follows: Length overall, 37 ft.; wing span, 46 ft.; wing area, 610 sq. ft. Petrol (135 gallons) 1,025 lbs. Total load carried 2,940 lbs. Power loading on full power, 13-4 lb./h.p. ; power loading, on normal power, 14-15 lb./h.p. ; wing loading, 10-65 lb./sq. ft.
No detailed performance figures are available, but the maximum speed of the civil "Seamew" is about 101 m.p.h., and the stalling speed 52 m.p.h. The rate of climb at sea level is 540 ft./min. With the quantity of fuel given (135 gallons), the range at cruising speed is about 300 miles. As already mentioned, if the land undercarriage is discarded, the useful load can be increased by 200 lbs., and if this is devoted to fuel and oil the range will be correspondingly increased. The Supermarine "Seamew" should be a very useful type for routes where there is not enough traffic to warrant the employment of a larger machine. As a private owner's "air yacht," the type has much to recommend it. 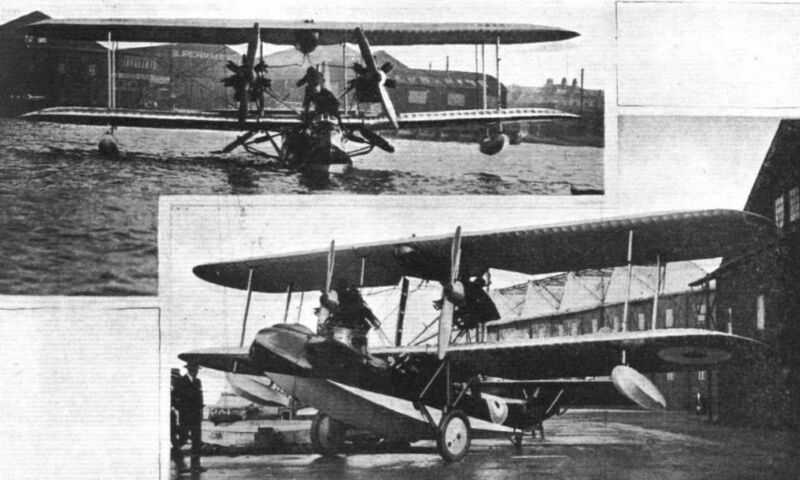 THE SUPERMARINE "SEAMEW": Two views of the Service Version.